« Ice Cream. A Sweet Panhead Chopper By Bill Dodge. Published by Cyril Huze April 12th, 2016	in Chassis, Customs and Editorial. 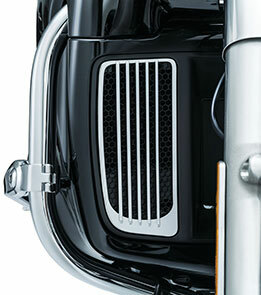 These new Küryakyn® Radiator Grills for Harley-Davidson® Twin-Cooled High Output Twin Cams provide a nice touch of chrome to enhance fairing lowers. 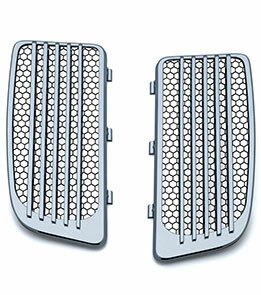 A clean chrome-finished ABS grill housing shrouds a black honeycomb-shaped metal screen insert that combats debris while leaving radiator airflow unrestricted. OK, I don’t mind that my heads are liquid cooled, in fact I like the fact that the bike runs cooler, but I don’t want to call attention to the radiators with chrome grills. I think the MoCo did a good job keeping those thinks as subtle as possible. To each his own. Some continue to like as much chrome as possible! everyone i have talked to that has one of these twin cooled bikes love them, most of them sharing big waves sentiments. if it keeps the inner thighs from sizzling … great! I have yet to try a LC version. Does it really make a difference in the heat? Summer time, right inner thigh can get uncomfy when not moving. Most do not want to call attention to the fact that it is liquid cooled !! Yes they will all look like gold wings!!! Does anyone actually buy any of the cheap, Chinese junk that Küryakyn sells?